The official Facebook page for Futurama announced that a mobile game for the beloved series is "coming soon." 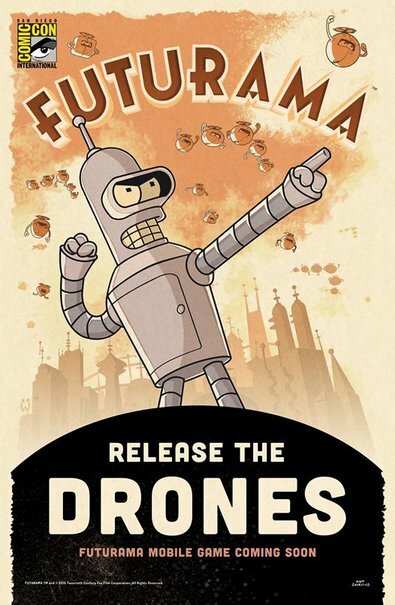 The upcoming game was revealed on the official Futurama Facebook page Wednesday, with an attached image that indicates the title will be Release the Drones. "Good news, everyone! A Futurama mobile game is on the way! Get ready for shiny robots, evil forces and new adventures" the post reads. An attached link takes users to a page with naught but an image of Bender majestically pointing at who-cares-what, and the option of signing up for email updates. No developer is listed. The Facebook image also includes the logo for San Diego Comic Con which, conveniently enough, is this week. Other FOX franchises that have gotten the mobile game makeover include the The Simpsons: Tapped Out and Family Guy: The Quest for Stuff, both of which are free-to-play. With a Futurama mobile game on the horizon, prepare for the "shut up and take my money" memes.